A Facebook friend said she'd heard a rumor about Johnny Depp's buying Wounded Knee. I found the article below and the story took off. By Martyn PalmerSuch is Depp’s commitment to the Native American cause, he is planning to spend millions of his own money to return land, Wounded Knee, in South Dakota, to their ownership. The site, the scene of an 1890 massacre, is up for sale for $3.9 million. Local Native Americans say they cannot afford to buy it. Depp is outraged. Is he really prepared to pay for the land? Explosive White Clay, Walking out on Nebraska’s Gov. & Johnny Depp buying Wounded Knee --Oglala President Bryan Brewer[LRI] *pause* [awkward silence from interviewer as the goosebumps settle] Uhhh, is that all Mr. President about White Clay for now [President Brewer chuckles], how about Johnny Depp, is it true you’ve been in contact with him about possibly buying Wounded Knee? By Meghan KeneallyThe Lone Ranger opened on July 3 and is estimated to lose between $150million and $200million due to the film's $215million production budget and additional $175million for marketing. 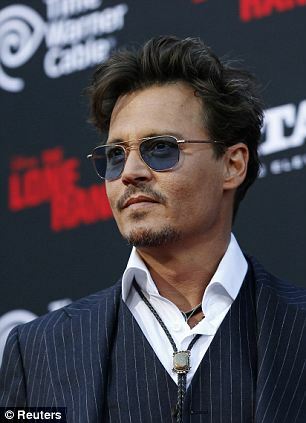 The money is no matter to Depp, however, as he plans to make the move for Wounded Knee using his own personal savings. Depp's standard salary is said to be around $20million per picture, and his total net worth is in the $200million to $300million range. By Julia Lynn Rubin"Without an accurate pop-culture idea of a real-life Native American in moviegoers' heads, Tonto is less of an individual character than he is a key piece of the popular image of a large and diverse population. The stereotype is particularly detrimental for its fantastical elements," pointed out Adrienne Keene of Native Appropriations. However, it appears as though Depp wants to reverse this idea, or at the very least, try to do something positive for the Native American community. "It's very sacred ground and many atrocities were committed against the Sioux there," he said of Wounded Knee in a recent interview with Mail On Sunday.Yeah, Depp wants to reverse the idea...that he created with his version of Tonto. Because his stereotypical portrayal is causing the movie to tank. The proposal that President Brewer spoke of was explained later in the meeting and called for Czywczysnki to receive his asking price of $4.9 million from any potential buyer who would gift the land back to the tribe and then donate half of the money back to the descendants for the possible erection of an "interpretive center." President Brewer made it a point to say that the tribe or the descendants would not be accepting any financial help from the Federal government due to their role in the 1890 massacre. He would also state during the meeting that he would be more than willing to pursue the land through Eminent Domain. A process that he would later state could tie up the land for years. However he felt that the best approach would be to enter in to a profit sharing agreement like the one he proposed that could potentially free up some funds for the descendants to create a place where they could tell their side of the story.